We studied the Sr isotope composition of shells of modern shallow-water mollusks and coral fragments. Twenty five of the studied samples were collected in beach zones of open oceans and marginal seas; twelve and eight additional samples are from saline and freshened inland seas respectively. The 87Sr/86Sr ratio in samples from the Atlantic, Indian, and Pacific oceans and their marginal seas corresponds on average to 0.709202 ± 0.000003 and coincides with the average ratio in the standard USGS EN-1 sample. The average 87Sr/86Sr ratio in inner parts of evaporite subbasins of the Mediterranean and Red seas is identical to that of the oceanic water. In shells of shallow-water mollusks from the Black Sea and Sea of Azov, where the degree of seawater dilution by riverine runoff is as high as 50 to 70%, the 87Sr/86Sr ratio is lower than that in the oceans by only a value of 0.00002 on average. As oceanic waters penetrated into these freshwater basins no earlier than in the Holocene, we conclude that the Sr isotopic equilibration with the oceanic water is realized very rapidly in the epicontinental seas even under conditions of restricted water exchange with the World Ocean. 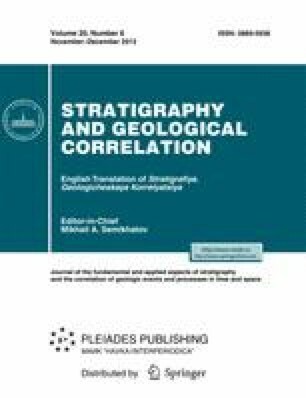 The established uniformity of the Sr isotope composition in all geographic types of currently existing sea basins open to the World Ocean proves the efficiency of the Sr isotope stratigraphy in correlation of contemporaneous chemogenic sediments. Original Russian Text © A.B. Kuznetsov, M.A. Semikhatov, I.M. Gorokhov, 2012, published in Stratigrafiya. Geologicheskaya Korrelyatsiya, 2012, Vol. 20, No. 6, pp. 3–19.